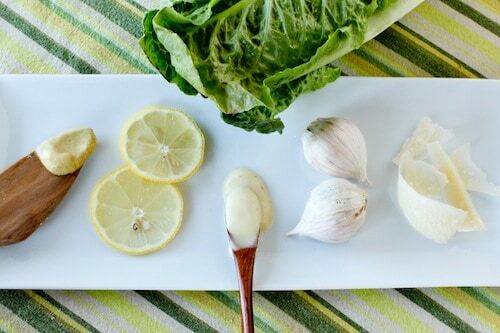 Caesar Dressing | Good. Food. Stories. You know how you can instantly hit it off with someone and then discover something about them down the line that, whether or not it was a throwaway piece of info at the time, defines your memory of them for all eternity? Cyndi—my first best friend from college, who lived across the hall from my freshman dorm room and with whom I shared my first college beer—loved many things: Coke (original, not diet), the Indigo Girls, the fleecy sweats we both bought at the school bookstore, watching Empire Records for the millionth time. But there was one of her quirks that I still remember to this day: she hated lettuce. Hated lettuce? I always considered lettuce to be the Baxter of the vegetable world: never the most popular part of a salad, mostly forgettable and bland, but too innocuous to hate. I couldn’t fathom having such a strong opinion about salad greens like that. But people are funny with their vegetables. I mean, I hate butternut squash with a fiery passion. My husband can’t stand raw tomatoes because of the goopy seeds hiding inside—he won’t even pop a sweet, perfect cherry tomato in his mouth because the seed-splosion inside is such a texture violation. In contrast to Cyndi’s perfect salad, which would be lettuce-free, his would be nothing but lettuce and a few carrots strewn about for color. Maybe that’s why he prefers a Caesar salad over all others. Or maybe it’s the Caesar dressing that I liberally toss with the lettuce leaves that makes him happy to eat his greens. I’ve experimented with many a recipe for Caesar dressing over the years: coddling the egg à la Julia Child (i.e., boiling it for one minute to supposedly kill any latent salmonella beasties) is too fussy and, frankly, never seemed to make much of a difference in turning the egg from scary-raw to all-clear. Adding avocado or pre-made mayo turned the dressing too thick and dip-like. Others were too tart or too flavorless. What follows is the platonic ideal of Caesar dressing that even you lettuce-haters can strew all over those leaves with wild abandon: salty and tangy but not too lemony, mellowed by a hit of good, fruity olive oil, and with absolutely no hint of fishy flavor from the anchovies. Don’t be tempted to leave them out: like fish sauce, another divisive but life-changing ingredient, the fillets add a deeper, richer flavor to the dressing than the Parmesan alone can provide. Extra salad bits like croutons (or, ahem, a cherry tomato or two for the non-traditionalists) won’t hurt, but this dressing lets lettuce stand on its own. Now, don’t hate, but there’s one little (*cough*expensive*cough*) secret to making this the Caesar dressing to end all dressings. And that’s, well, my super-powered high-speed Vitamix . I said, don’t hate. And though the Vitamix’s mucho macho horsepower turns the consistency of the dressing into thick liquid gold, I fell in love with this recipe long before the Vitamix seduced me with its speed and elegance. The dressing will still be sublime if made in a workaday blender like my old KitchenAid, which I depended on for years, though it won’t be as thickly emulsified and luscious. Remove the inner plug from the lid of your blender and drizzle the oil slowly into the blender while running it on high speed. Go slow and steady with the oil, continuing to pour in a thin, steady stream until it’s fully incorporated and the dressing is thick. 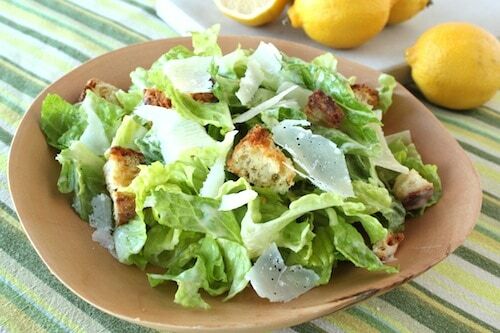 Serve with your favorite lettuce and fixings—shavings of Parmesan cheese, homemade croutons, and whole anchovies if you’re daring. There will be extra dressing; it will stay fresh in a covered container in the refrigerator up to 1 month.